This blog has a somewhat ubiquitous name because there’s no singular direction about what we do here. All I can say for sure is that I’m a food blogger of foods that will likely kill you if you eat them. 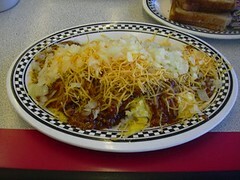 St. Louis’s Perfect Slinger: The Slinger is the drunk food and hangover cure of choice for St. Louisans. Over the past two years, we have gone and out had over 30 slingers and every single one of them has been different from the last. I have in my head an idea of the perfect slinger, and I’m going out and about every chance I get to find that slinger. So far, it’s not out there, but we’ve gotten close a few times. 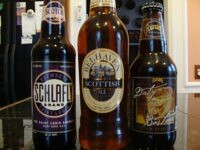 Beer Squared: My father in law and I love beer. Beyond that, we love trying new beers. We’re beer snobs, not beer nerds, but as we try more and more beers, we’re hoping to make the switch from beer snobs to fully fledged beer nerds. Read along on our adventure as we try more and more beers to see what we like the best. Fish Frydays: In St. Louis, we’ve got a great tradition of Lenten Fish Frys. For right now, we’re only doing Catholic Churches in the City, but that will change. I love fried fish and have for years. 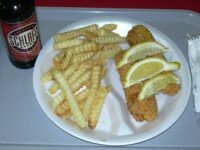 It always brings back great memories of the fish fries my dad used to do in our garage. There’s no competition or rating these, but just telling the story of our experience when we head to a new Catholic Church for fish and a cold beer. This column only appears during the Lenten season. On the Road: I travel a nice bit each year and I’m always hitting a bar or restaurant that needs to be recognized in that area for it’s awesomeness. What the hell? : From time to time, I’m going to eat or drink strange things, and this is where I’m going to post about those. Stuff like the Tomko Special and my White Castle Latte. 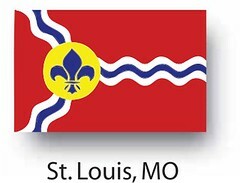 The 13 Blog will always have a St. Louis City-Centric perspective. It’s not a knock on the suburbs but a commitment to our sometimes vilified home. My family and I are proud St. Louis City residents and my writings here will reflect how much we love our home. In time, we’ll venture outside of the City, but we’ll always remain committed to our City Pride. I have enjoyed your blog for sometime now. I have a question for you. In your quest for the perfect Slinger have you run across any establishment that serves S.O.S.? I make my own but once in awhile I would like to eat out and have one. Truth be told, Allen, I don’t know what an S.O.S. is…sorry. *Shortcut-Try Stoufer’s creamed chipped beef. Get Thomas brand english muffins. Toast and pour creamed chip beef over english muffins. Bam! Gourmet. Carondelet Diner we have it every saturday Delicios!!! Carondelet diner we have it every saturday morning Delicious!! !